Photographs show unusual animal carcasses found in Panama and Montauk, New York. 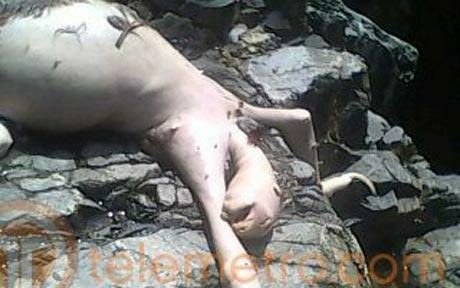 Photographs show unusual animal carcasses found in Montauk (New York) and Panama. People say that this monster washed up ashore in Montauk, NY. Some say it’s real others say it’s just another fake picture. The image of the “monster” provoked much debate over whether the creature photographed was a concocted hoax or a real animal, and if the latter, exactly what kind of animal it might have been. Various laymen and animal experts tried their hand at examining the photograph and determining what it depicted, but there seemed to be no consensus on the matter. William Wise, director of Stony Brook University’s Living Marine Resources Institute, after looking at the photo and consulting with a fellow biologist (who knows land creatures), disagrees [that it’s a dog]. He knows what it isn’t. He said the general body shape looks like a dog or other canine (“Coyote?”). But that the “prominent eye ridge and the feet” don’t match. He said the feet and face look “somewhat ovine” — that would be like a sheep — but sheep don’t have sharp teeth. “No other animal has a body like that,” Mr. Arikian said. 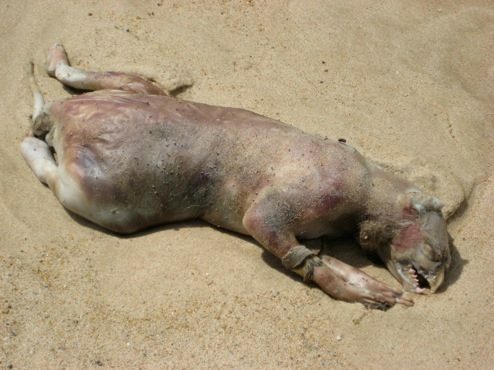 Since the Montauk Monster’s supposed remains were never made available for examination (they were said to be rotting in the backyard of a local resident who remained unidentified by the creature’s putative finders), no definitive determination about the nature of object depicted the photograph was ever made. An autopsy of the remains revealed that “Panama Creature” was a hairless sloth that had reached the “bloated” stage of decomposition. [New York] Newsday. 31 July 2008. The East Hampton Star. 30 July 2008. National Geographic News. 9 November 2009.